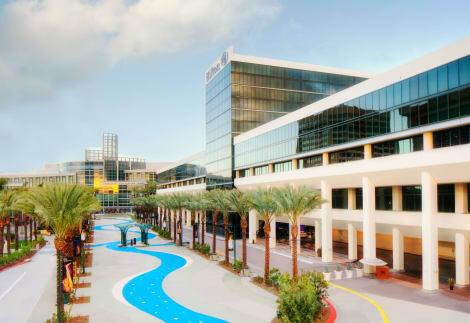 Enjoy a satisfying California experience at the Hilton Anaheim hotel, located in the heart of Orange County, adjacent to the Anaheim Convention Center and across the street from the Disneyland® Resort. Reach the hotel easily with convenient access from all major freeways and Southern California airports.Host a diverse range of events at this California convention hotel, taking advantage of over 140,000 sq. ft. of versatile event space, including two large ballrooms, several meeting rooms, and spacious sundecks. Catch up with work at the business center featuring office services and equipment.Sip a cocktail in the ultra-modern surroundings of the Mix Lounge before enjoying a locally sourced meal in Mix Restaurant. Grab a quick bite with family and friends at the food court or choose your favorite coffee at the on-site Starbucks®.Work out at the fitness center featuring the latest fitness equipment or take a relaxing swim in the outdoor pool. Indulge in a spa treatment while the children make new friends at the Kids Club in the water play area. Enjoy Disneyland® Resort benefits at this Anaheim family hotel by paying a visit to the Disney® Desk where expert cast members will offer advice and tickets to the world-class attraction right across the street. Experience the magic of Disneyland® Resort from a special Disney® View room, providing great views of the fireworks display and the resort. All guest rooms and suites feature modern comforting amenities and contemporary styling. Welcome to DoubleTree Suites by Hilton Hotel Anaheim Resort - Convention Center. Begin your stay at this hotel with our delicious freshly baked cookie and allow our attentive staff to cater to your every need. 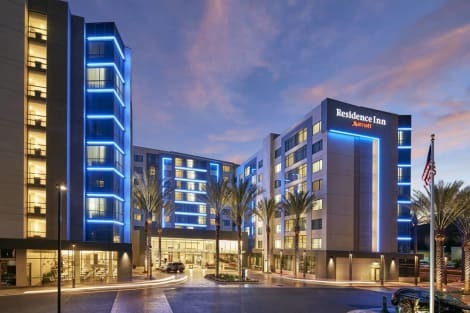 Ideally located one block from the Anaheim Convention Center and just one mile from Disneyland® Park and Disney's California Adventure® Park, the DoubleTree Suites by Hilton Hotel Anaheim Resort - Convention Center provides easy access to all the city has to offer. 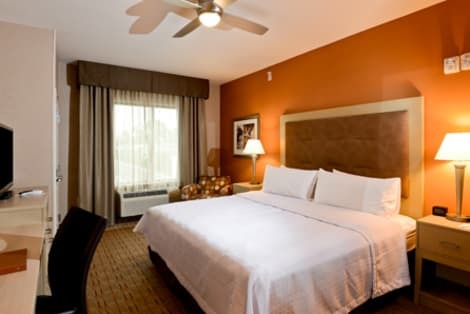 Orange County Airport is also conveniently located only 12 miles away.Every guest room and suite at the hotel features stylish, contemporary design. Each room boasts amenities for your comfort including; plush-top mattresses, premium cotton linens, a refrigerator, microwave and high-speed internet access. Upgrade to a suite for extra space with a separate living area and special upgraded amenities, including a sleeper sofa and two, 37-inch flat screen HDTVs.Host a meeting or celebrate a special event at the hotel with an abundance of flexible meeting rooms, ideal for small to large groups. Corporate guests will also appreciate our fully equipped business center, open 24-hours for your convenience.Stay active by working out in the fitness center or swimming laps in the pool. Located on the second floor overlooking the Anaheim Resort, our heated outdoor pool and spa provide a relaxing atmosphere to enjoy the warm California weather. Choose between two tempting dining options within the hotel offering a range of delicious cuisine, expertly prepared with fresh, seasonal ingredients. Make yourself at home in one of the 42 air-conditioned rooms featuring refrigerators and microwaves. Complimentary wireless Internet access is available to keep you connected. Private bathrooms with bathtubs or showers feature complimentary toiletries and hair dryers. Make yourself at home in one of the 174 air-conditioned rooms featuring refrigerators and flat-screen televisions. Complimentary wireless Internet access keeps you connected, and digital programming is available for your entertainment. Private bathrooms with shower/tub combinations feature complimentary toiletries and hair dryers. Conveniences include desks and complimentary weekday newspapers, as well as phones with free local calls. Be sure to enjoy recreational amenities, including an outdoor pool, a spa tub, and a fitness center. Additional amenities at this hotel include complimentary wireless Internet access, babysitting/childcare (surcharge), and an arcade/game room. Make yourself at home in one of the 973 air-conditioned rooms featuring flat-screen televisions. Complimentary wireless Internet access is available to keep you connected. Private bathrooms with shower/tub combinations feature complimentary toiletries and hair dryers. Conveniences include phones, as well as safes and desks. Make yourself at home in one of the 39 air-conditioned rooms featuring refrigerators and flat-screen televisions. Complimentary wireless Internet access keeps you connected, and satellite programming is available for your entertainment. Conveniences include desks and microwaves, and housekeeping is provided on a limited basis. With a stay at Motel 6 Anaheim - Buena Park in Anaheim, you'll be a 2-minute drive from Adventure City and 6 minutes from Knott's Berry Farm. This motel is 2.2 mi (3.6 km) from Medieval Times and 4.3 mi (7 km) from ® Park. 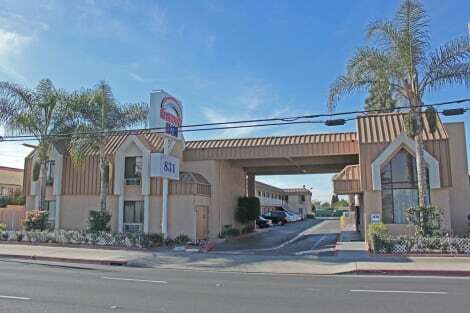 Budget Inn Anaheim near Disneyland Drive is 10 minutes' walk from Disneyland Resort. The non-smoking motel offers free WiFi and an outdoor swimming pool. The property provides coffee and danishes in the morning as well. 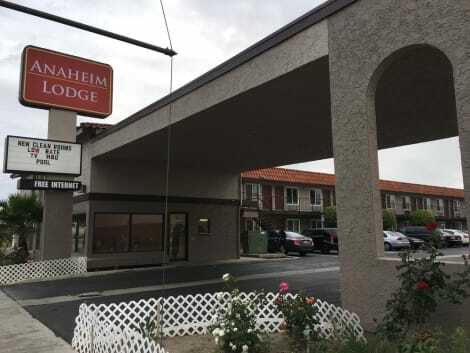 Guest rooms at Budget Inn Anaheim feature a 42-inch LED TV and ironing facilities. Microwaves and refrigerators are also included in every room. The lobby offers free pastries and coffee every morning. Free freshly brewed coffee and danishes are available all day, every day. The hotel reception is open 24 hours and is able to assist with booking shuttles and tours for local attractions. The Anaheim Convention Center is a 5 minutes' drive from the Budget Inn. Knott's Berry Farm amusement park less than 8 km away. 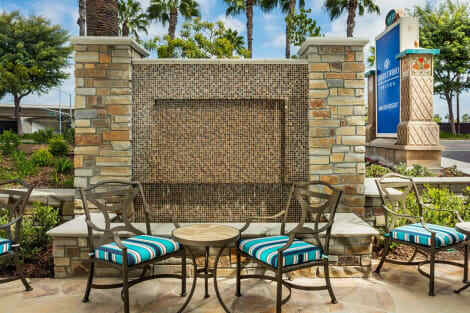 Discover the Candlewood Suites Anaheim Resort Area. Our hotel is an ideal choice thanks to our premier location and staff. We offer cozy, home-like hotel suites and within walking distance to the main gate at Disneyland® Resort, and the Convention Center. We are conveniently located within walking distance to shopping, dining and entertainment: Anaheim Sports Center and The Shops at Anaheim GardenWalk. Our apartment-style suites offer comfortable living areas and fully equipped kitchens, comforts of home. Our Disneyland® hotel in Anaheim is within minutes of the Honda Center, Angel Stadium and Anaheim Ice, all top destinations for sports fans. Shuttle services from our hotel to local attractions are available for a nominal fee and are provided by Anaheim Resort Transportation (ART). Save time and skip the line at Disney®! Our hotel is an authorized Disney® ticket seller. Purchase discounted tickets at the front desk or contact the hotel for more information. Our hotel offers free Wi-Fi, flexible workstations, spacious suites with fully-equipped kitchens, 24-hour desk staff as well as 24 hour Candlewood Gym and free use of laundry equipment. The Candlewood Cupboard offers sundries and beverages for our guests; Visit the Lending Locker and Library where our guests can find anything from a George Foreman Grill to board games for the family and a vast DVD selection for our guests whenever they want to relax and have a movie night. 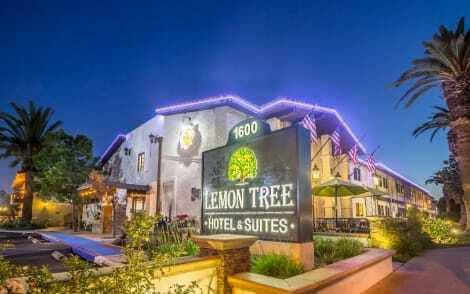 lastminute.com has a fantastic range of hotels in Anaheim, with everything from cheap hotels to luxurious five star accommodation available. We like to live up to our last minute name so remember you can book any one of our excellent Anaheim hotels up until midnight and stay the same night.